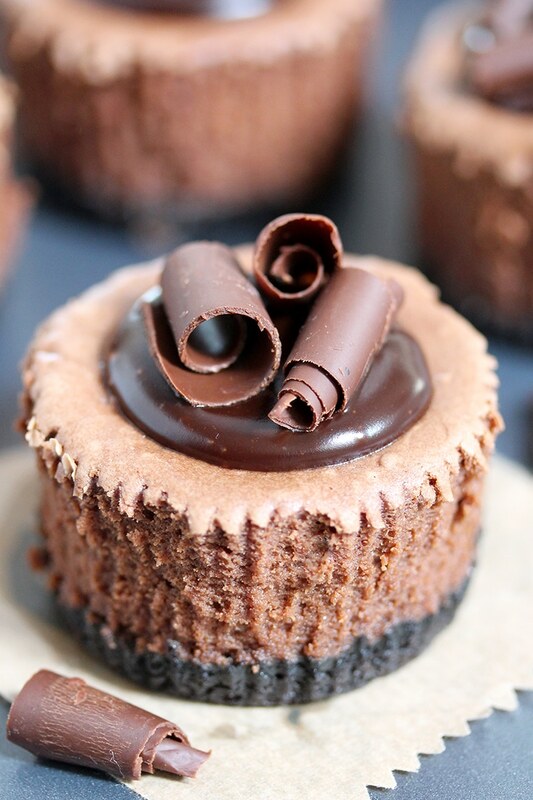 Chocolate Mini Cheesecake with Oreo Crust – this creamy, rich cheesecake with full chocolate taste and Oreo layer, topped with chocolate ganache and formed as mini cheesecakes, will be loved by all the chocolate fans. They look fancy, taste awesome and they are easy to prepare. Oreo crust, creamy chocolate cheesecake layer and chocolate ganache make a perfect combination. With the very first bite you will feel this full, rich taste of chocolate and cream cheese. 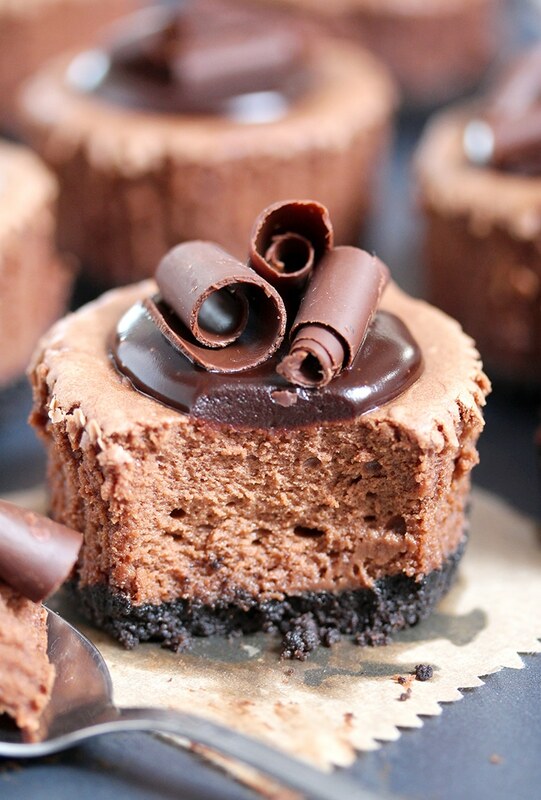 What do you need to make Chocolate Mini Cheesecake? 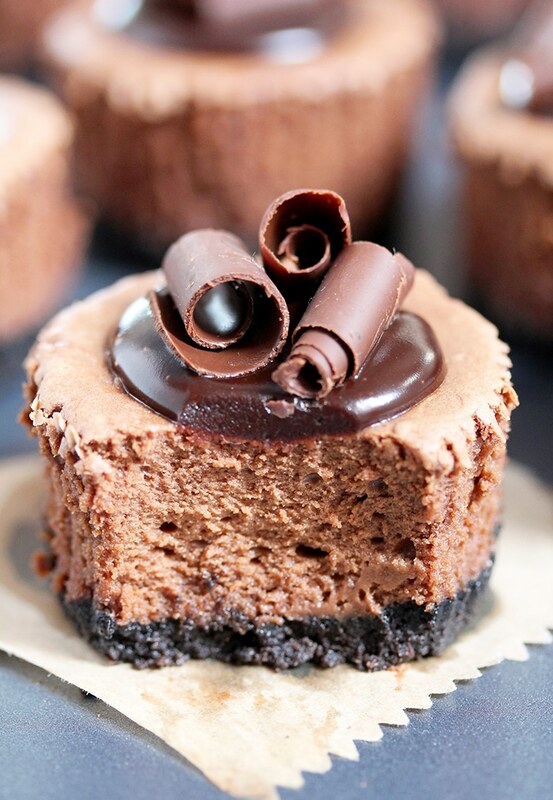 How to prepare Chocolate Mini Cheesecake? Preheat the oven to 300 F. Line a muffin pan with 16 foil cupcake liners. Combine Oreo crumbs with butter and press at the bottom of the cupcake liners to form a layer. Melt chocolate chips and leave to cool. In a large dish beat cream cheese, sugar and vanilla, at medium speed, until it becomes smooth. Add eggs and beat some more, until creamy. Finally, fold in melted chocolate and beat until combined. Spread over Oreo layer and bake for 20-25 min. Take out of the oven and leave in a muffin pan to cool completely. Transfer to the fridge for at least 2 hours, or until chilled. To make ganache – Put heavy whipping cream in the pan, on medium heat, and then remove from heat, before it comes to boil. Add chocolate chips, oil and chocolate syrup, then stir until smooth. Spoon ganache on top of each cheesecake. 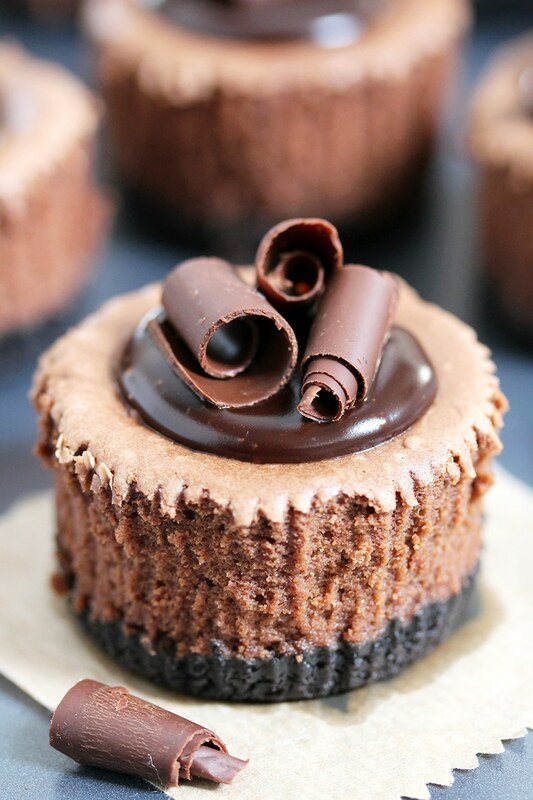 Decorate with chocolate swirls. What is important for cheesecake to be tasty? Cheese should be at a room temperature, so it could easily fold in with the other ingredients. Eggs should also be at a room temperature. Use quality semi sweet chocolate or chocolate chips. Try not to over mix the dough, it is going to be airy and then you risk making cracks while baking it. Beat at a low speed. Mini Cheesecake fans should check NO BAKE CHOCOLATE PEANUT BUTTER MINI CHEESECAKE, CARAMEL APPLE MINI CHEESECAKE and CHOCOLATE CHIP MINI CHEESECAKE. 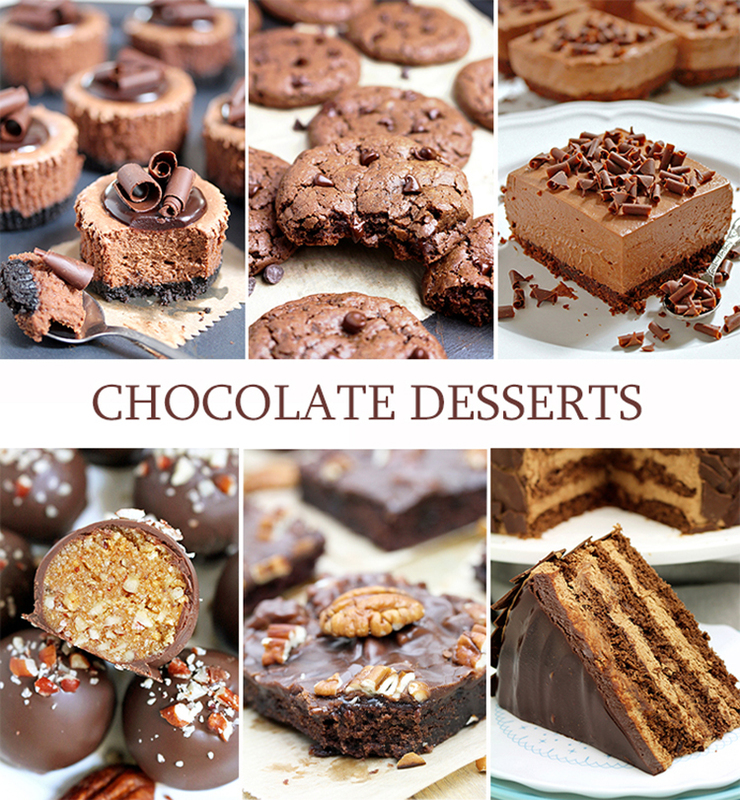 If you prefer chocolate, take a look at some of our most popular chocolate recipes on the blog REESE‘S PIECES PEANUT BUTTER CHOCOLATE LASAGNA, CHOCOLATE CHIP COOKIE LASAGNA and PEANUT BUTTER CHOCOLATE POKE CAKE. 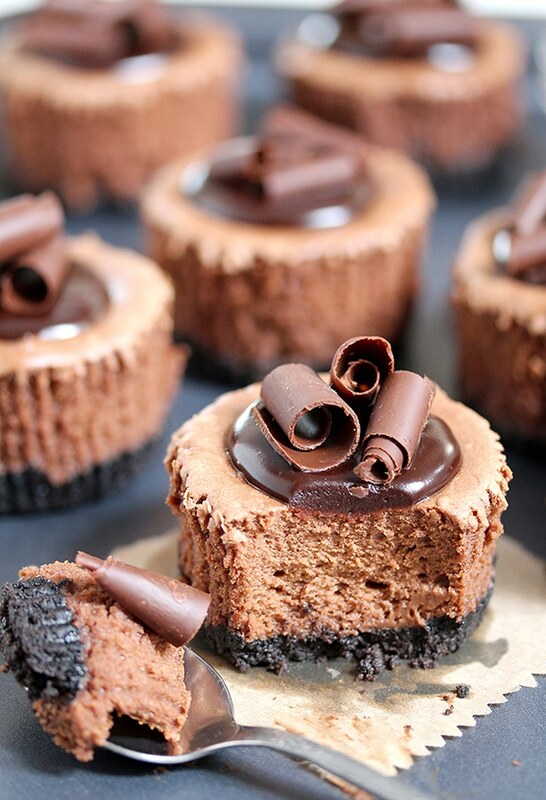 Chocolate Mini Cheesecake is your dream dessert. If you were looking for a perfect chocolate dessert, you have found it. Enjoy… It will be love at first bite, I am sure! Line a muffin pan with 16 foil cupcake liners. Set aside. Preheat the oven to 300 F. Put Oreo cookies in a food processor and pulse until fine crumbs are made. Combine Oreo crumbs with melted butter. Divide the mixture between the cupcake liners and press. Set aside. Melt chocolate chips, following the instructions on the package and leave to cool. In a large dish, beat cream cheese, sugar and vanilla, at low speed, until creamy. Add eggs and beat until creamy. Finally, fold in melted chocolate and beat until combined. Spread over the Oreo layer and bake for 20-25 min. Take out of the oven and leave in the muffin pan to cool completely, and then transfer to the fridge for at least 2 hours, until chilled. Remove foil cupcake liners. Put heavy whipping cream in the pan, on medium heat, and then remove from heat, before it comes to boil. Add chocolate chips, oil and chocolate syrup, then stir until smooth. Spoon ganache on top of each cheesecake. 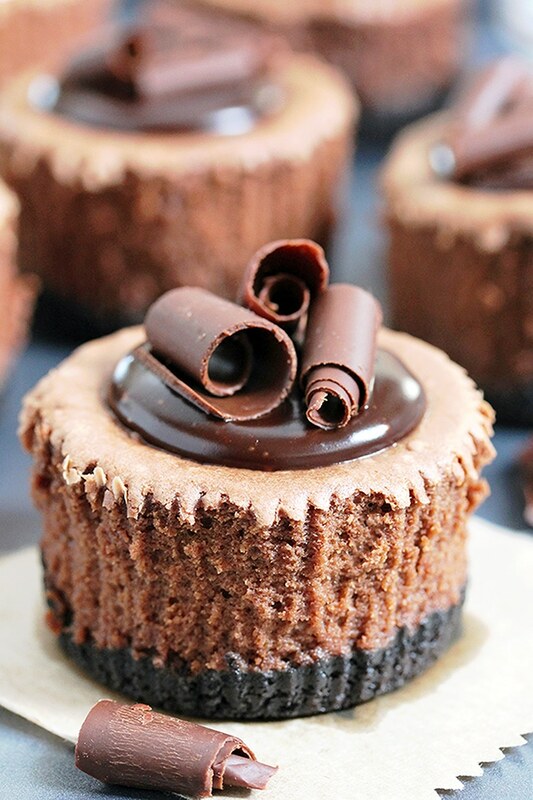 Decorate with chocolate swirls. Is 18oz of cream cheese correct? They turned out great thank you! The cream cheese at my store comes in 8 oz packages. What’s the easiest way to get 18 oz? Or find 3 oz pack and take 6. How do you make the “hot whipping cream”? Just heat up on the stove? Yes Christina, you can heat up whipping cream on the stove. Thank you for answering all of my questions. I made a half recipe since it’s just my husband and me. They were delicious! Thank YOU, Christina.. I’m so glad that you like it. Your ingredient list says 2 eggs for the cheesecake part but the instructions only say to add “an egg”. Help. Yes Jennifer – “ad 2 Eggs”, thanks for your observation. No Tracy, I used a muffin pan with 16 foil cupcake liners.